Last week I wrote about the devastating earthquake that struck the beautiful city of Christchurch in New Zealand. The news has been shocking – large parts of the city including the CBD have been destroyed, homes reduced to rubble, and the number of those who lost their lives is continuing to climb. Around the world there has been a moving response to the tragedy. International search and rescue teams from Australia, Japan, China, USA, UK, Thailand, the Philippines and Singapore are helping the many New Zealanders working on the ground, underlying the international dimensions of the tragedy. Many foreign nationals have died in the earthquake, partly because one of the deadliest building collapses housed an international language school. Christchurch at the time was stacked with high ranking US trade and commerce officials who had just finished a US-NZ Council summit with their New Zealand counterparts. (I was due to attend but my knee surgery has limited my long range travel). I have been in the US and the UK over the last week and everyone has been asking me about the situation, showing amazing concern. Another New Zealander who has been giving international support is Phil Keoghan, the host of The Amazing Race (Season 18 premiered on CBS last night) and a New Zealander (and a Cantabrian) to his toes. His appeal – put out over Craig Fergusson’s Late Late Show on CBS on Saturday night – is for people to keep visiting New Zealand. The Scot wondered if people would feel strange about traveling to a country where one part was devastated. But Phil reassured them, “It is actually the best thing that people can do to feed the economy. The rest of New Zealand is open for business, and we need to communicate that … It’s the best thing that people can do.” See Phil’s interview on the CBS Early Show this morning. My wife Rowena and daughter Bex have made a contribution to the appeal started by the shelter provider Habitat for Humanity; and Johnny McCabe, and ex-Saatchi & Saatchi creative director has come up with a great rugby idea we’re getting in front of Steve Tew at NZRU this week. It’s all hands on deck!! Yesterday I wrote about the boomers and how they’re still one of the most important consumer groups on the planet. Funding the cost of the retiring boomer generation is a headache many Western nations have to deal with. Younger generations have been much less populous, creating a demographic mushroom cloud where a shrinking tax base faces the challenge of stemming rising costs associated with pensions, healthcare and other services required – and demanded – by retiring boomers. Migration can compound or relieve the problem. Over 2010 and 2011, 120,000 people are expected to leave Ireland in response to the Emerald Isle’s economic woes. In Australia it’s the reverse. At 2.1% Australia’s population growth, two-thirds of which is driven by new arrivals, is double the world average. BusinessWeek weighs in with ‘The Youth Unemployment Bomb’, highlighting some big points and chilling statistics. In the Middle East and North Africa youth unemployment is at roughly 24% according to the IILO. In most other places around the world the numbers are in the teens. In the US, 18% of 16 to 24 year olds were unemployed in December 2010. In some countries a gulf is deepening between the young, educated and unemployed, and older generations who are holding tightly to their jobs in the post-crash world. Disaffected young people are protesting, or in places like Tunisia and Egypt, launching revolutions. Others are dropping out of the workforce altogether, depressed and resigning themselves to joblessness. The other option is to move, if you can afford to. Packing up your stuff and shifting across the world in search of a better life is a shift as old as time. Fortunately today, mobility is easier and choice of Promised Land greater. The challenge for many countries is re-invention in the face of the global economic squeeze. The events of Egypt show the tolerance for command and control is at an end; that people want freedom; that the end can come very quickly; and then what? I don’t have many answers, but I do know that ideas hold the key to everything. If all leaders present are a set of tough choices, they won’t bring people along with them. Ideas are the currency of the future. This year the first of the baby boomers will hit retirement. They’re the wealthiest generation in history, the first mass market, and in many ways the main shapers of the world as we know it. The “Me Generation” is coming of age. Radically hopeful and driven by an unbridled optimism for what the world can be, boomers have made an indelible mark on every facet of modern life over the last 65 years. Culture, politics, religion, relationships, markets and movements have been redefined by this generation. Boomers enjoy life and that’s reflected in their spending patterns. Spending by the 116 million US consumers aged 50+ topped $2.9 trillion in 2009. That’s up 45% over the last 10 years. By comparison, $3.3 billion was spent by the 182 million US consumers under 50, an increase of only 6% over the decade, according to an analysis commissioned by USA Today. The Me Generation is also the We Generation. A 2010 study found that close to half (47%) of American internet users aged 50-64 now use social media – up 88% from the previous year. And US Facebook users aged 55+ grew from about one million in early 2009 to 10 million in early 2010 according to istrategy.com. Not bad for a bunch of squares. The boomers are doing what they do best: Redefining long-held cultural expectations. This includes defying conventional thinking that says older people tend to spend less, can only be reached through traditional media, or in fact are homogeneous in any way. The only real rule for brands that want to stay relevant to the boomers is that nobody wants to be reminded that they’re getting on (the Wall St. Journal recently ran a very good item on this). Boomers have never believed in limits, so any suggestion that you’re slowing down or less than fully capable is anathema. This is a generation that believes in dreams and adventure. Heads up to marketers: Don’t get too distracted by Gen-Y, whose loud and constant assertion is that the world is all about them. The generation that made love its rallying cry is still crying out for it. My heart goes out to the people of Christchurch in my homeland of New Zealand. For the second time in six months they have been struck by a devastating earthquake – the one yesterday closer to the surface, right in the center of the city, deadly and massively destructive. There are many shades to Christchurch – more quintessentially English than England; a gritty working class underlay; an innovative university and business city; the best provincial rugby team in the world; gateway to the wonderful South Island. Hold fast to those memories; shock and sadness prevail. There is nothing to do today except bow our heads and hope and pray and send our love. A bevy of thoroughbreds have shot out of the stocks a few weeks out from New Zealand’s premier horse racing event and are now parading the streets of Auckland for a good cause. 18 life-size fiberglass horses have been transformed into breathtaking works of art by celebrities, artists and designers, including Saatchi & Saatchi, in the lead-up to Auckland Cup Week as part of the Resene Fastest Art Exhibition. This journey mirrors that of 18 real thoroughbreds competing for the $2.2 million Telecom New Zealand Derby at Ellerslie. Each work of art has a benefiting charity. We’re backing the TYLA Youth Trust which I have been involved with for a number of years along with my daughter Bex. TYLA delivers tailor-made programs to help inspire ‘at risk’ youth to turn their lives around. TYLA currently has two programs running – Otara and Auckland Central West – and is looking to expand its programs into more communities, working with the New Zealand Government, local communities and Police. The goal is to identify youth who are on a pathway to crime, and to step in before their wayward journey takes them too far. 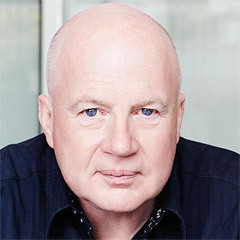 The Saatchi & Saatchi Design Worldwide team, a crack unit within the global network, has unveiled their horse ‘By A Nose’. 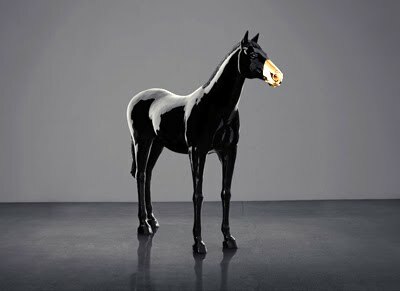 Exemplifying the belief that good ideas are everything, the high gloss black horse with gold plated nose visualizes the idea that the value of a race horse is in its nose – the first part to cross the line. Right now ‘By a Nose’ is leading the stakes in the online auction of the frilled up fillies. The auction will close at the end of the Auckland-wide Exhibition Tour on the 12th of March, with all proceeds going to each artist’s chosen charity. You can back a winner too. To support TYLA simply “Like” our Facebook page. The horse with the most likes will win a $5000 cash top-up for their charity. Running a global creative enterprise throws out challenges that travel across strategy, innovation, imagination, operation and execution (on a slow day!). The most satisfying work is voracious for unconventional blends of insight and ingenuity. To expand the mindset, I keep a look out for anything far out on the edge, thoughts that run a mile from the ordinary, thoughts that can connect disparate strands, and thoughts that look to the brighter side of life. Blancmange: origins and travels of a heavenly sweet almond flavored pudding, recipe inclusive! Fireworks: pyrotechnics traditions from China to Europe, and their purpose. Obsidian: the supernatural fascinations of black volcanic glass. Pell Mell: the space between no order / rank / discrimination on one side and chaos on the other. Qabus Nama: “Book of Good Counsel”, an eleventh-century Islamic etiquette guide that’s ideal for young nobles preparing to rule. Shabby Chic: a portrait of unassuming dishevelled style, not least Arthur Rimbaud’s impact on the likes of Kurt Cobain and Patti Smith. Showstopper: anecdotes on bringing the action to a stop. Velocity: A story on Marcel Proust’s love of rapidity. In December I was in Istanbul after a four-year absence – I last visited in 2006 to speak to a group of senior staff from the advertising and media industries. It barely took me a heartbeat to remember what an incredible place it is. Istanbul is electric, energizing and intoxicating. Turkey has one of the fastest growing economies in the OECD and Istanbul is a hot hub where east meets west, ancient meets modern, and commerce and cultures converge. The strong and diverse influences that meet here have threatened to pull other places apart, but here they work together like the rich and welcoming tapestry of a Turkish carpet – such is the success of Turkey it has been held up as a model for other Middle Eastern states, most recently including Egypt, as the New York Times reports. The city is a Lovemark of mine. As a place with a rich history it’s steeped in mystery: the Church of Hagia Sophia and the Blue Mosque share the skyline with skyscrapers, and sacred and secular influences are interwoven everywhere. It’s hard to think of anything more sensual than the sights, sounds, tastes and textures of the Grand Bazaar (if you want a shopping experience that involves you this is the place! ), and while it’s home to 12 million people, Istanbul is intimate. The average age is less than 30, and it’s known for the friendliness and hospitality of its residents. A local sums up Istanbul best: “You should feel it to understand what kind of city it is!” Sinan writes on Lovemarks.com. And yet, as Turkey inexorably modernizes, the mainstay of advertising remains trapped in the old, reason-driven world, dominated by the “-ers” – bigger, faster, cheaper and so on. I don’t expect that to last. Turkish shoppers are savvy. They drive a hard bargain and demand quality. Price and performance are table-stakes. 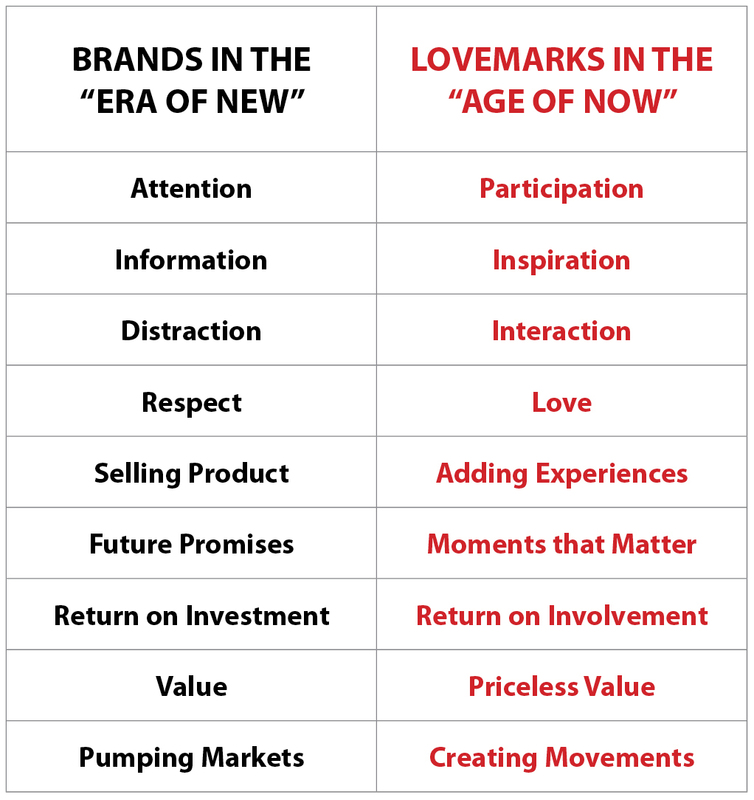 This is a place with an undertow of feeling and passion as strong and rich as its history, waiting for new brands to make the leap to Lovemark through emotional connections. 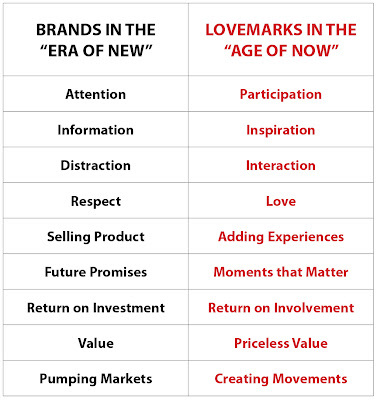 We recently blew on the embers of that fire by releasing The Lovemarks Effect: Winning in the Consumer Revolution in Turkish, following on from earlier launches of Lovemarks: The Future Beyond Brands and Sisomo: The Future on Screen. It’s just a matter of time before the tinder takes. The gateway to this emerging market is the heart. Here’s an idea made for the moment. TED, the non-profit organization behind the famous TED conference whose purpose is to propagate Ideas Worth Spreading, has launched TED Books. In typical TED style the digital books will only be as long as is absolutely necessary to convey one big idea powerfully: no more than 20,000 words. 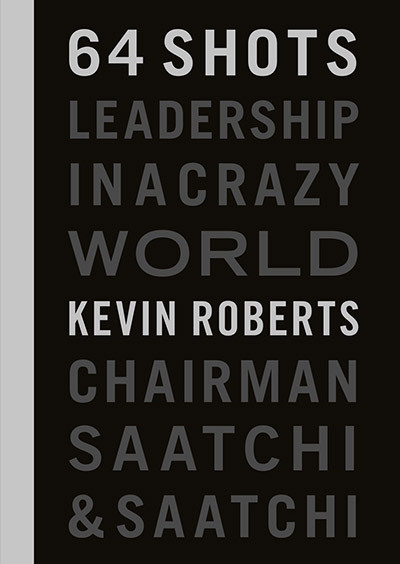 Each inspirational volume is intended to be read in one riveting sitting. Enough said, available at Amazon. Thanks Google for being with the program. Shades of Robert Indiana’s Love sculpture in NYC on 6th and 55th. Today, turn it on for that someone you love. A few weeks ago I ran the news that our agency in Argentina, Del Campo Nazca Saatchi & Saatchi had been named Ad Age’s International Agency of the Year. The agency had made a video to support their entry, and it featured a soundtrack from the Spanish language version of the Broadway musical Rent by Jonathan Larson. The song Seasons of Love can only be described as anthemic: a chorus of voices soaring high in glorious unison. It’s one of those can’t-get-that-tune-out-of-my-head numbers. Answer = Love is the only proper measure of a year in a human life. Well, a quick Google turned up the film version of the song Seasons of Love. It’s a joy, and for this reason only – joy – I’m putting the clip up today. Turn up the volume and share. Sensuality, along with Mystery and Intimacy, is one of the three magic ingredients in a Lovemark. Sight, scent, hearing, touch and taste are gateways to the emotions and a powerful means of connecting with the consumer. Each sense is profoundly complex, to a point where they defy description and easily slip from your grasp when you try to pin them down. Why is it easier to imagine what a lemon tastes like than to imagine what it smells like? What’s an acquired taste, and why do you acquire it? Why doesn’t food taste good when you’ve got a cold? Do you need to know what good taste is to dress in bad taste? The next consumer paradise is less about the product and more about the magic created around It. Starbucks blazed the experience trail, and is a pro at sensory infusion. They recently tuned into the times pretty nicely with two exclusive CDs worth a go. The first, World is China, celebrates Chinese New Year, which really resonates this year for Saatchi & Saatchi as we will create the new global brand advertising campaign for Lenovo. World is China is a sumptuous compilation of vintage and vibes. Among the gems you get to experience are: Zhou Xuan, the Edith Piaf of China; Beijing’s legendary orchestra featuring 30+ instruments; Wu Yingyin, “Queen of the Nasal Voice”; DJ Nappy G making innovative use of a Chinese children’s choir; A Happy New Year song from Pink Martini; and hip hop group Dragon Tongue Squad rapping on Chinese Cooking. The second CD, I Got You Babe, celebrates love in all its giddy glory, as we head into Valentines. It’s a classic and evocative journey with titles ranging from Some Velvet Morning to Stick with Me Baby to Dream a Little Dream of Me to Falling Slowly. Big combos, (Robert Plant & Alison Krauss, Hall & Oates, Sonny & Cher, Marvin Gaye & Tammi Terrell, Ella Fitzgerald & Louis Armstrong, Nancy Sinatra & Lee Hazlewood), mixed genres and sweet beats. Steve Jobs is seriously ill. He had surgical treatment for pancreatic cancer six years ago and last year had a liver transplant. He has recently announced he is taking leave again to fight some new complications from the cancer. For the time being he will continue as Apple’s CEO. He’s been one of the heroes of our age because like another hero of mine, Wayne Gretzky, he’s never bothered about where the puck was or where it is but he’s intuitively known where it’s going. (In his case, the puck was people.) He’s changed our lives. But Apple is more than a one-man band. Jonathan Ives is a wonderful designer, Scott Forstall is a great software guy and Phil Schiller is a top marketer. TBWA Chiat Day are great advertising partners and Tim Cook is the most effective, underrated COO out there. I’m sure all of us are hoping for a miracle and that Steve heals and can return. I think though that the time is right for him to pass over the reigns formally to Tim Cook who ran the place through Steve’s previous two absences. If I were the Apple board, I’d encourage Steve to make the call and become Creative Chairman, and promote Tim to CEO. This would provide certainty, security and safety for employees, customers and shareholders. Whatever happens, get well soon, Steve. “Your search for happiness produced no results”. That’s the somewhat depressing message you get if you type ‘happiness’ into the search function of the UK Office for National Statistics’ (ONS) website. Thankfully the ONS’s own search to identify what makes Britons happy is bearing more fruit. The department recently released the initial results of its public consultation process to identify what its new index of national wellbeing (which I first wrote about last year) should measure. All of these are a refreshing change from the focus on GDP, pay levels and other economic indicators that have been a proxy for measuring what is important in a society and measuring progress. The ONS will continue to consult with people on what makes them happy until April, before developing its new measures to track Britain’s wellbeing. While plumbing the deep causes of our happiness is important, there’s just one question I’d like to add to future surveys to make sure we’re getting a true snapshot of the moment rather than something over-thought: Are you happy today? Think about this as it’s a real “Age of Now” question. Psychologists have found that people are distracted from the task at hand nearly half the time, and this daydreaming consistently makes them less happy. The lesson: get focused on the present. Africa’s collective GDP in 2008 of $1.6 trillion was roughly equal to Brazil’s or Russia’s. By 2020 that’s projected to increase to $2.6 trillion. Combined consumer spending in Africa in the same year was $860 billion, and is expected to grow to $1.4 trillion in 2020. 316 million new mobile phone subscribers have signed up in Africa since 2000. 20 African companies have revenues of at least $3 billion. African has 60% of the world’s total amount of uncultivated, arable land. 128 million African households will have discretionary income in 2020. Importantly, McKinsey’s report indicates that Africa’s growth is not purely driven by a boom in the prices countries can get for their natural resources, but also by growth in sectors like wholesale, retail, agriculture, telecommunications and manufacturing. In September The Economist invited contributions from a group of respected economists on the question “Is Africa poised for rapid, steady growth?” Like McKinsey, the esteemed journal points out that in 2009, when the world economy shrank, sub-Saharan Africa continued to expand. And just recently The World Bank raised its forecast for economic growth in the region to 5.3 percent in 2011 as the global economy recovers. Across the board the point is well made that Africa is not a single homogeneous state and that to speak of “Africa’s” future in any such way is fraught. Individual countries on the continent are faring very differently and face different challenges to varying degrees. Conflict, corruption and social fragmentation are among the biggest hurdles and won’t be put to rest easily. That said, the (so far) peaceful secession of Southern Sudan from Northern Sudan to form the world’s newest country promises to be a very positive development, and after a decades-long civil war would be a bright point for the whole continent. These conversations about Africa are helping to reframe the way that we think about it. There are still headlines about poverty and hostility. But there are also reports of promise and hope. Two years ago I spoke at the Royal Albert Hall between David Cameron and Bob Geldof, whose entire speech was about the possibilities of Africa – not as a market but as a movement. If we can change the conversation into the positive there is also greater hope that Western policy makers will come to focus more on Africa as a continent that will benefit socially and economically from more trade rather than more aid. Greater flows of goods and services both to and from Africa will profit consumers everywhere. And if more of the lion’s share of the benefits can go to the lion economies of Africa in the process, that has to be a good thing. Much as I’m in love with most things Apple I also love the challenge that’s coming from Android, Google’s mobile phone operating system. Unlike Apple’s OS, the Android platform is an open-source system, allowing users an unprecedented and unfettered ability to share apps of all shapes and sizes. Last month, Android officially overtook Apple’s iPhone IOS as the most used system in the US, further proving that in the participation economy, more freedom equals more involvement. As with the iPhone, you can download apps to your heart’s content for Android (200,000 so far), a huge number of which are free. The system is designed to make it easy for developers to unleash the full potential of smart phones, and they’re unleashing creativity everywhere. Android has even started taking a hold in the much buzzed about tablet wars. A couple of weeks ago Lenovo (our new global client) launched its Android-based LePad tablet for the Chinese market before it becomes a worldwide phenomena. The Samsung Galaxy Tablet (which also operates on Android) had sold 1m+ devices by early December. Still a far cry from the almost 15 million iPads already on the market, but impressive nonetheless. And the Android fan base is so loyal they might be confused for Apple fanatics. The web is filled with videos and blogs from enthusiastic hackers who have hacked phones that aren’t designed to run Android so that they do – including iconic brands like Nokia and, yes, even the iPhone. I’m hopeful the competition will challenge the few things about Apple that I don’t like: no Flash on the iPad, being served up with mono-tasking on the iPad, the perplexing usability of the iTunes set-up, their dismissive attitude towards anyone else who may have an idea. One of the marks of greatness is humility, and in that spirit a healthy respect for your fellow innovators is never out of place. In the end this is a great contest between two Lovemarks renowned for their innovation, Apple and Google. And the ultimate winner will definitely be you and I.